It’s 6:15am and I’m sat on my mat, rolled out to the view of the lights of London’s buildings, currently shrouded in darkness – the sun isn’t set to rise until around 7.20. 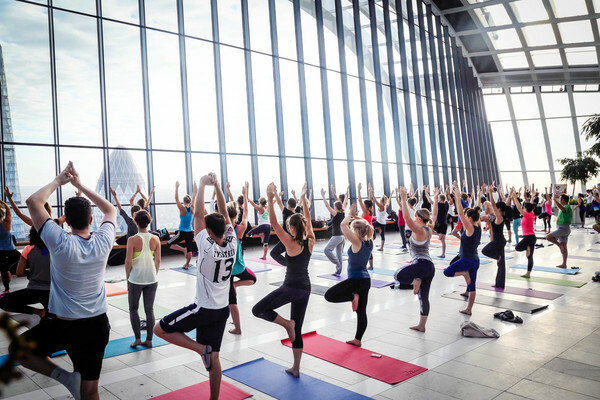 We’re up on the 35th Floor of the ‘Walkie Talkie’ building at 20 Fenchurch Street in London, in the stunning surroundings of the Sky Garden, patiently awaiting the start of our early Power Yoga class with Issy Scobie of Flex London. The sky garden is a little chilly first thing, but it’s meant to provide that outdoor feel, so I’m prepared and have wrapped up in a hoody and a scarf (which are gradually removed as I warm up). You come out of the lift to a beautiful landscaped garden, with trees and flowers and uninterrupted views across the City – a truly stunning place to practice yoga (and, I imagine, have dinner or a drink as there is also a café, bar and restaurant up there!). It was a beautiful class; Beginning in a gentle child’s pose, becoming aware of our breath and slowly moving up through several sun salutations. A mindful, powerful warrior sequence blended with some primary series postures mixed up with a twist or two and I’m left feeling energised and looking forward to my day in the office. After our savasana we took a further moment to remind ourselves of our purpose, and set our intention to be aware of ourselves throughout the day, not to rush from one thing to the next but to savour each and every moment as it happens. Afterwards, the sun has risen and you can now see London in all of its glory and my, what a site it is! I’ll be back on Thursday morning at 6:30 to practice again, and on the 26th. What a way to start the day.